We are delighted to feature this great, veteran stalwart of the Boston jazz scene. If you like tasteful, creative and soulful tenor saxophone playing (and who doesn't?) you had better be sure to get your tickets early for this concert. This intriguing East Coast/West Coast collaboration is sure to make for a memorable evening of adventurous, exhilarating jazz! Jim Cameron (tenor saxophone): Jim is a veteran saxophonist who lives near Boston, Massachusetts. He studied with Lee Konitz and Jackie McClean, but his style has been described as "of the Sonny Rollins school". Jim is one of Boston's first-call players and has always been involved in the steady gigs in that city's most well-known jazz venues, such as the 1369 Club, the Regatta Bar and the Top Of The Hub. He has also appeared as a featured performer in the "Tribute to Lester Young Festival" sponsored by the Boston Globe. Jim Cameron has performed with Jim Rotondi and the NH Jazz Orchestra, as well as with the Special Edition Jazz Orchestra on a concert/cruise aboard the USS Liberty Ship John H. Brown. As a member of the Boston Factory Jazz Project, Jim has toured in Italy, performing in 19 concerts in Tuscany and Abruzza, (one of which was a solo saxophone recital). Jim is often featured as a guest with the David Amram Trio and also maintains a weekly Boston gig with the Pocket Big Band (on baritone sax). 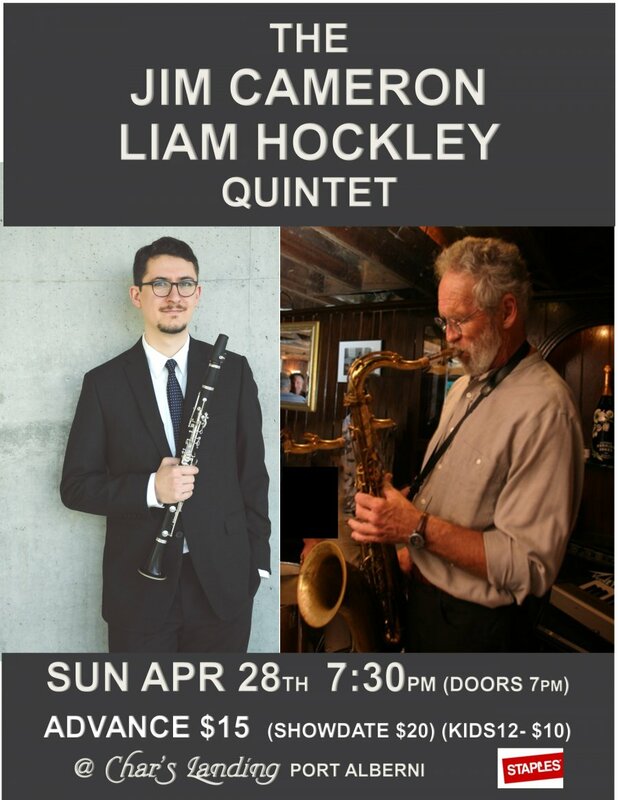 Liam Hockley (clarinetist) is a versatile musician whose creative practice focuses on the creation and promotion of new and experimental music. As an artist for whom “alternative or avant-garde approaches to his instrument are only part of the everyday tool kit” (Georgia Straight), Liam’s repertoire encompasses not only the major twentieth and twenty-first century works for his instrument, but also the results of collaborations with Canadian and international composers on innovative new works across a broad spectrum of aesthetics. Recent performances include premieres of new works by Ray Evanoff, Kimberley Manerkirar, Eva-Maria Houben, Stefan Maier, and Joan Arnau Pàmies, as well as the North American premieres of works by Karlheinz Stockhausen, Michelle Lou, Horatiu Radulescu, and Jürg Frey. Liam has been the recipient of numerous prizes and awards including an interpretation prize at the 16th Stockhausen-Konzert und -Kurse Kürten in 2015. Liam completed his Doctor of Musical Arts degree in clarinet performance at the University of British Columbia. His dissertation, “Performing Complexity,” examines performer agency in works that feature musical/physical ‘impossibilities’, hyper-extended instrumental techniques, and complex notational systems and was supported by the prestigious Joseph-Armand Bombardier Canada Graduate Scholarship (SSHRC) and a University of British Columbia Doctoral Fellowship. Liam holds a Master’s degree from the University of British Columbia, and received his Bachelor’s degree from the University of Victoria, graduating with distinction in clarinet performance. His teachers have included François Houle, Cris Inguanti, Patricia Kostek, Earl Thomas, and Christian Gossart. In his spare time, Liam enjoys playing jazz and is looking forward to his upcoming "mini-tour" with Jim Cameron, who, many years ago, gave Liam his first clarinet lesson. Ron Hadley (piano): Ron is originally from the Boston area, where he took private lessons at the New England Conservatory with jazz piano legend Jaki Byard while studying theory and jazz improvisation at Berklee College of Music. He has performed throughout North America and Japan, and his lifelong professional involvement in the latter country (In addition to ongoing concert and workshop tours in Japan, Ron also works as a translator and interpreter.) led to his relocation to the Pacific Northwest. Rick Kilburn (bass): Born and raised in a musical family from Vancouver, B.C., bassist Rick Kilburn grew up listening to and playing jazz. He attended the prestigious Berklee School of Music in Boston, Massachusetts, during 1973/74, and from there moved to New York, where he worked as a bassist with such diverse players as Dave Brubeck, Mose Allison, Airto, Flora Purim and Chet Baker. Rick has enjoyed a forty-five year career, working with some of the best. During this period he has played at The Village Vanguard, The Village Gate, Bradley’s, Bottom Line, the Rainbow Room, the Blue Note in New York City, The Top of the Senator and Maple Leaf Gardens in Toronto. Concert venues that Rick has performed at include: Avery Fisher Hall (Lincoln Center), Carnegie Hall, Kennedy Center, Boston Symphony Hall, the Orpheum, and Queen Elizabeth Theater in Vancouver. As well, guest appearances, accompanying various jazz groups performing in concert with Symphony Orchestras include: The Dave Brubeck Quartet with the Cincinnati Symphony, New Orleans Symphony, Ohio State Symphony, Joffrey Ballet with the Chicago Symphony at Ravinia, Southern Cross Quintet with the Vancouver Symphony Orchestra. Buff Allen (drums): Based in Vancouver, Buff has had 45 years of professional playing experience in jazz, pop, theatre, recording studios, concert tours, television, and movies. Since returning to Vancouver in 1984, he has played with leading artists including Diana Krall, Paul Horn, Pat Coleman, Oliver Gannon, Fraser MacPherson, Ron Johnston, Tommy Banks, and Hugh Fraser, as well as visiting artists Benny Wallace, Joanne Brackeen, Kenny Wheeler, Chuck Israels, Barry Harris, Mose Allison, Rob McConnell, and Guido Basso. Since 1981, Buff Allen has become a familiar figure on jazz festival bandstands around the world from Vancouver, Edmonton, and Montreal in Canada to Dublin, Brussels, Glasgow, and The Netherlands.